Grind the tomatoes and pour it into the vessel in which you are going to boil the rasam. Add the tamarind extract to it. Add turmeric powder, asafetida and salt to taste. Mix well. Add about 1.5 cups of water and start heating on low to medium flame. In the meanwhile, roast all the items mentioned under “roast and grind” till a nice aroma arises and the toor dal and slightly changed color. Grind everything into a smooth paste using a little water. Add this ground paste also to the simmering rasam. Mix well. Also add a tsp of jaggery. Let everything simmer for about 15 minutes. Make sure you cook on low to medium flame if your keep it on high the rasam will boil very quickly and will boil over. 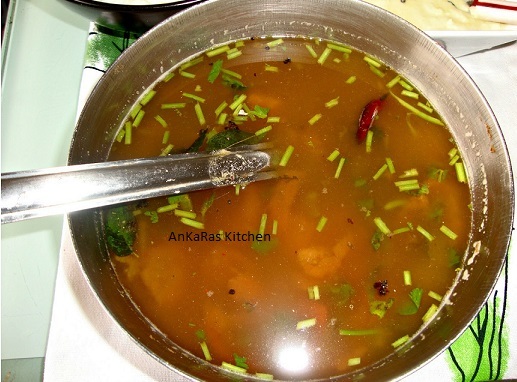 You can add a ladle in the vessel while it is simmering to prevent the rasam from boiling over. Add the remaining half cup of water to the cooked and mashed dal mix well and add it to the simmering rasam. Add chopped coriander and curry leaves. Remove from heat when rasam starts frothing. Do not boil. Heat a small frying pan with ghee and add mustard seeds and cumin seeds. Pour this over the rasam close with lid and let it sit for about 5 minutes. Serve hot with rice and some spicy potato curry.